. It was pleasant, clean, large room, big windows. If you are looking for extreme luxury - this isn't it, the gym is a bit shabby. However, it was way above my usual student budget hotels. The location is near freeway so hollywood and other sights are a short step away. There is a mall attached - good for cheap food. Movies to order were $13 bucks - way too much. The parking is $20, however there are a few $10 lots open right next to the hotel. (Make sure to ask the parkign lot if it is open on weekends). Overall, I definitely got what i paid for. The hotel has large rooms and a pleasant atmosphere. Location is perfect for sightseeing by car. The room service wasn't too thorough, and it would help if the parking wasn't $20. 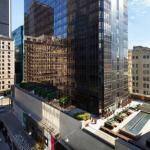 I've stayed at many hotels in downtown Los Angeles. No one ever wants to pay $25+ for hotel parking. This by far was the easiest to find parking on the street. I booked a regular room but I think we got a large suite (2 separate rooms in the suite - 1 bedroom the size of regular hotel rooms, and another room which was the living area, etc.). Front desk did not inform us of this when we checked in, so it was definitely a pleasant surprise! Huge room? or Was it free upgrade? There were a few ants on a table in the room. This a fine hotel in a very convenient location. You'll enjoy this one! The personnel (front desk and bartender) were both exceptionally helpful. If you are looking for a place in the heart of Los Angeles, the Sheraton Los Angeles Downtown Hotel might be a good option. You can expect to find the perfect blend of luxury and affordability. Part of the international Sheraton chain of hotels, you are sure to find nothing but world-class facilities and unparalleled services. Nestled in the center of the financial district and ethnic enclaves, the hotel is in close proximity to museums, theaters, shopping malls, tourist destinations, and an unlimited number of dining options. It is near some of the most famous and attractive tourist destinations like the Hollywood Walk of Fame and Universal Studios, the shopping heavens of Beverley Hills, and many international/domestic airports, including LAX (15 minutes). There is something for everyone. Staying true to California's sentiments on smoking, the entire hotel area is a non-smoking zone. 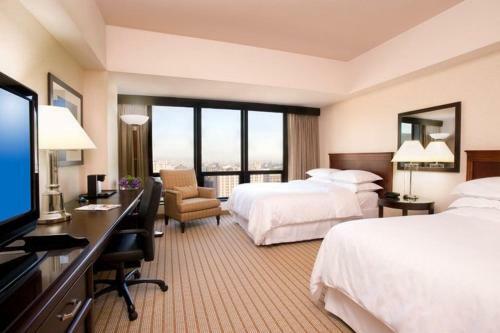 At the Sheraton Los Angeles, you get to stay in a centrally-located place that provides easy access by taxi to all the major tourist hubs of the metropolis, at affordable rates. If you are looking to explore the area further, a short 45-minute commute south of Los Angeles will bring you into the famous Orange County area that offers Disneyland and beautiful beaches. Business travelers and tourists alike will be drawn to the strategic location and hospitable staff of the Sheraton Los Angeles. All 485 guest rooms are elegantly-furnished and polished to perfection. Every room boasts a long list of amenities including, but not limited to complimentary newspaper service, ironing facilities, refrigerator, cable television, hairdryer, and wireless high speed internet access. And Sheraton Club Cardholders can enjoy a heightened level of luxury with added services such as free bottled water, upgraded amenities, and special access to the Club Lounge. 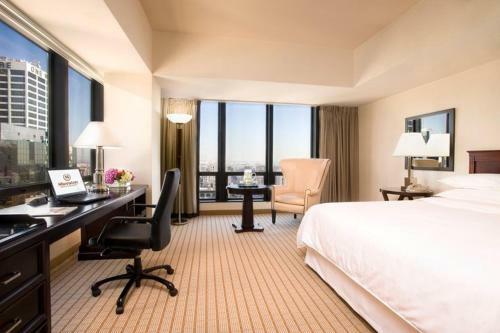 From the west end to the east end, you will marvel at the impressive range of facilities and amenities offered by the Sheraton Los Angeles Downtown Hotel. Some of the facilities include laundry/valet service, a fully-equipped business center, a fitness center, and outdoor heated pools. For Sheraton Club Cardholders, the 24-hour Club Lounge offers complimentary breakfast, office supplies, and much more. From the moment I walked in to the moment I left, I felt like a royal guest. Every necessity and service was at my disposal. I really loved the warm, cozy aura of the hotel and felt really comfortable. Los Angeles is a city that definitely has a lot to offer, but without any guidance and a limited number of days to spend, a person can go crazy. But I found the staff really helpful and willing to map out my day as I wanted. And staying in downtown Los Angeles, the heart of the city is a great centrally-located area that has much to offer, no matter what direction you turn. 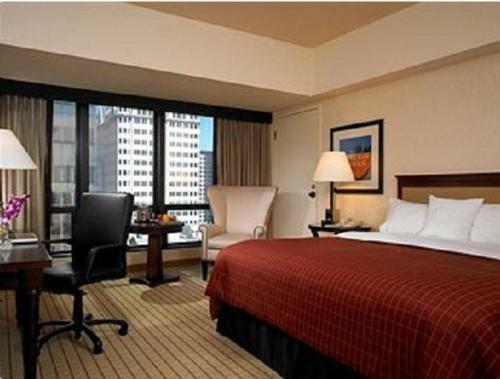 Staying in downtown hotels are never a bad idea if youre looking to stay amidst the hustle and bustle of city life. The restaurants dont offer the best variety in cuisines, but since downtown LA is moments away from all the ethnic enclaves like Chinatown and Little India, you will never have to worry about a dearth of dining options.